I’m very happy to see more details of this excellent design. We’ve been following the construction progress on their YouTube videos. Now, they’ve added a website with much more information. I have to say, this is one of my favorite designs. It is very well thought out, very affordable, very practical. I would love to include a photo of this home in my upcoming earthbag book. If you’re the owner, please contact me. The following information, photo and drawing are all from the Half Moon Earthbag Earthship website. The Half Moon is a kind of cabin in the mountains, built with some special features that make it livable and sustainable at low cost in its very remote, off-the-grid location. Like typical cabins in the mountains, it is intended to be used as a getaway place for the rest of my working life. It is also my hope to live in the Half Moon when I retire from full time work. The idea was to build the shell of a cabin, built on earthship principles but with earthbags instead of tires. The structure would be my vacation (and/or disaster) refuge for the next five years, during which time I would finish it out to a more livable permanent residence. The systems and design, however, would be very simple: the smallest necessary 12 volt electrical system (enough to support 3-day visits) and no internal plumbing apart from cistern-fed drinking water. All waste would be forever composted, which ultimately would be placed in a future greenhouse. My design idea went through a lot of changes. I originally thought simple and square, then added on wings for rooms for tool storage and mechanical systems. 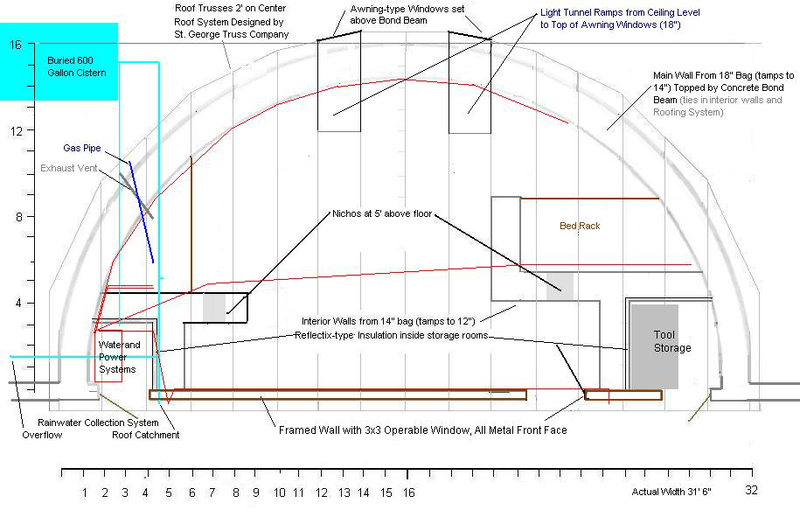 While Earthship modules are recommended to be U-shaped, Hunter’s [Earthbag Building] book points out that “underground, round is sound” and has an illustration of a site excavated for what appears to be a semi-circular structure. Since I was queasy about using an earth cliff, as many Earthships do, and I wanted to follow the best advice for building with earthbags, I ultimately accepted Ken’s suggestion to redesign the site plan in the round, with the shelter to take the form of a semi-circle (this ultimately led to Ken’s suggestion of the name Half Moon). The Half Moon was mostly built in July 2008. Prior to construction the site was excavated from a sloping area selected primarily because of its view of the mountains to the south. Excavation took place in one day in June, largely because of the preparation and skill of our operator, Mark. Much more information on this outstanding design is on the Half Moon Earthbag Earthship website. If you’re serious about building with bags, this plan is worth careful study. It’s one of the few true zero energy homes out there. The Half Moon is averaging 63 degrees inside with no supplemental heating. And because of the owner’s careful documentation, others can follow in his footsteps to take earthbag building to the next level. He’s difficult to get in touch with. Owen, please feel free to pass on my email address privately to anyone who wants it. I don’t mind being contacted directly, but would rather not post my addy publicly. Also, as I indicated a few years ago, the Half Moon was completed for full time living, with a larger solar electric system and a small greenhouse. I can supply updated info on the systems and performance if you like. You have my address. Thanks Bob. I consider this home to be top, top quality for energy efficiency, practicality of building, looks and over all design. I’d love to see more people building this way. So yeah, it would be great to have a followup article with more info. Thanks for the quick response and the email address. We just had one question the buttress wall that spans to the side of the cabin, are they required ? TIA. I just emailed you about this: The buttresses hold soil behind the house. You wouldn’t have to use them if you used less soil or built some other type of retaining walls (such as stair-stepped stones). When a little damp it binds together and wondering if we could use this instead of earth. Other types of rock dust/powders probably won’t work unless you add a binder such as clay, lime or cement. To me, the total burial of the round part of the Half Moon was elemental to its design. The berm goes up to the the height of the interior ceiling all the way around, and I wanted to carry it out some distance from the structure to keep a lot of earth between the outside air and the walls (this is one of the design’s more earthship-y characteristics). For many reasons, including the planned positioning of the solar panel over the east wing wall, and the need to set a cubic yard of concrete behind the west wing wall for the satellite dish, I also wanted lots of walking around room up top. I always thought of the wing walls as retainers, rather than buttresses, as the earth really performs a buttressing function all the way around. To this point, the round wall was actually set as a buttress against the berm, so that each bag layer is a tiny bit bigger than the previous one, and slightly farther from the base, kind of like the way a big dam looks. I think this is explained in the videos, though it has been a long time since I watched them. 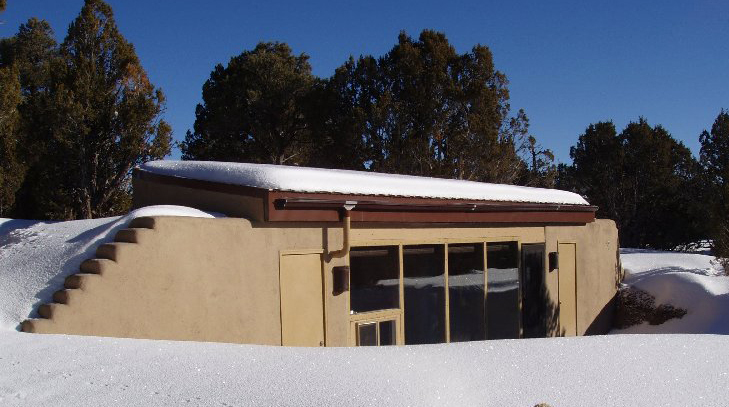 I realize that most people here only see the winter pic from before the building was finished, so things like the solar panel and satellite dish would not be obvious considerations. Also, the final plan had a cross section that showed the original grade and where the berm went. I don’t think I have a copy of that anymore, but I could look. I can definitely supply summertime pics of the finished project, as well as some finished interior pics if anyone needs them. For a quick look at the finished exterior, the cover page on the Earthbag Builders Facebook page should do. Thanks for the quick response and sharing the details. Owen was kind enough to share your email address. Sorry I didn’t know this page was here until today. The Half Moon has been my primary home for three years now, and my only home since January 2012. I anyone still has questions for me, I’m happy to respond. And if it’s not too late, the pics are there to be used by anyone who wishes. Thanks for the offer. That’s a fantastic home. Is it cheaper to build with bags?How much would it cost to build something like this!I would like to pack up and leave Canada to some south american country and get off the grid. However how much is involved with building codes and red tape! Read that and you’ll see why it’s almost impossible to pin down what it will cost. Briefly, you can spend as little or as much as you want. It will be far less expensive if you build in areas with few or no building codes. Please check our latest time-laps video on our progress. http://www.aardskip.com click on “blog” to see video. Very good. I’ll put this on our blog soon. 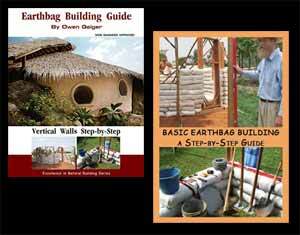 We will also build our earthship with dirtbags (sand bags). Our plot is just to far away from tyres. It will not be responsible to import tyres 500km. You’ll save a lot of time not pounding tires. Thanks, check our progress. Not super fast, but we are happy. http://www.aardskip.com click on “blog” to see our progress. I’m wondering about the retaining wall. Shouldn’t there be some way for water to drain when making these walls? Is this covered in the videos? ps. Am I the only one who’s having problems with the sites links? Also note, the area is very dry and so drainage is not a major concern since the ground is sloping away from the structure. The links all work for me. i WOULD LIKE MORE INFO ABOUT PRODJECT.. i WiLL BUILD SOMETHING SMALL FIRST THEN I WANT TO TRY A 1500SQ FT, tHANKS FOR ALL HELP. Everything is on their website and videos. Both Kelly and I agree that building earthships out of earthbags (sand bags or tubes) is faster and easier than using rammed tires. I tell everyone who will listen to do this simple test: ram one tire and earthbags of comparable size and see for yourself. Earthbag building is waay faster.